Another week of busy spring cleaning and organizing has gone by, and I think we've accomplished quite a bit this week. In my last post I talked about how I was re-configuring the layout of our office and dining room to make room for all four of us to have desk space in our office. Our office was home to our library, which consisted of four, rather full, bookshelves, plus a little half sized bookshelf next to my desk. So I decided to remove three of the four bookshelves, plus my little bookshelf, to make room for two more desks. Here is a link to a post I wrote a few years back when I had finished organizing the office bookshelves. Now, I am not one to part with my books, I really enjoy them, so I was only willing to part with outdated books and a few that I was no longer interested in. I was shifting through and sorting piles of books all week long, which was actually pretty fun. Sometimes I forget some of the great books I have and it was nice to be reminded of what I have, and what I need to make time to read. Since I had to put my books somewhere, we decided to move them to our dining room. Our dining room was previously home to my craft cupboard, as well as two smaller bookcases and a hutch that held my children's library, I love children's literature! 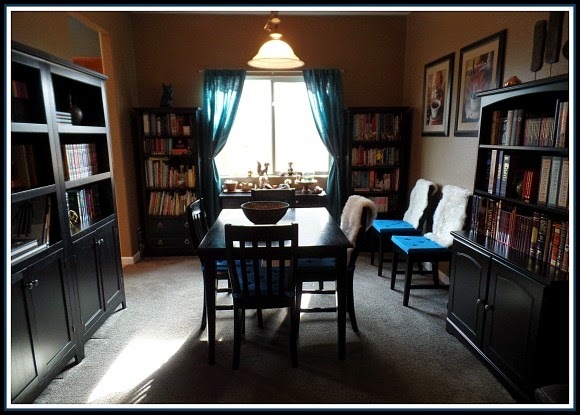 You can read a post I wrote a a few years back on my dining room craft area to see how it was previously set up. We also keep our growing collection of board games in our dining room hutch, and needed more space to hold some of the new games we have. So I got two new bookcases from Target that have cupboard doors on the bottom half, so we could hold the books from the office as well as properly store our board games. 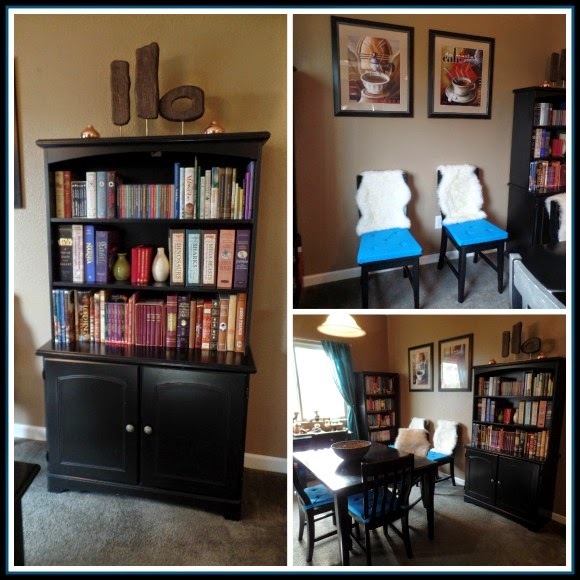 With quite a bit of furniture moving, and lots and lots of book sorting, here is how my dining room library turned out. I moved my hutch to the opposite wall where my craft cupboard used to be. My craft cupboard is now in my foyer, and my foyer table is under the dining room window. My old curtains were red, and so were my old chair pads, since they were nine years old, I decided it was time for an update, so I went with one of my favorite colors, turquoise. I found the chair pads at Ikea for a very reasonable price. :) I love the new color! Here are the two new bookshelves. I love the doors on the bottom half, we definitely needed more space for our board games and the bookcases are perfect for that. 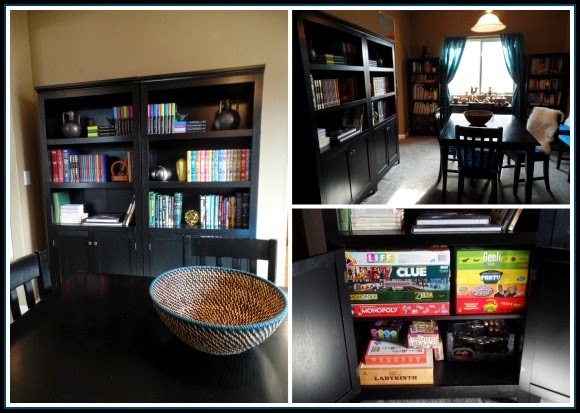 We found the bookcases at Target for a great price, it was a lucky find, at first I could only find brown, and since my other furniture was already black I had to stick with black. Just as I was about to leave for another store I spotted one black bookcase on the bottom shelf, and then asked if they had another in stock and they did! I have pretty much finished reorganizing the books, with the exception of two of the children's book shelves which I will finish this weekend, and I also want to go through our games and make sure they are all organized nicely, as well as organize the four drawers under the children's books bookcases, which hold small toys that my niece and nephew like to play with when they are over, and school supplies. So still a few finishing touches, but I am very happy with how the dining room turned out, it is so cozy and we are all enjoying it! Now that the office is cleared out, we have installed the two new desks, and are working hard to finish the office up this weekend. My biggest clutter challenge has always been paperwork, I still have plenty more to organize, but am making good progress. One thing I have always held on to in excess where catalogs. I love looking through them, and dreaming about things I wanted, and some of my favorite catalogs from when the kids were little had pretty art work on the covers that I always felt like keeping. 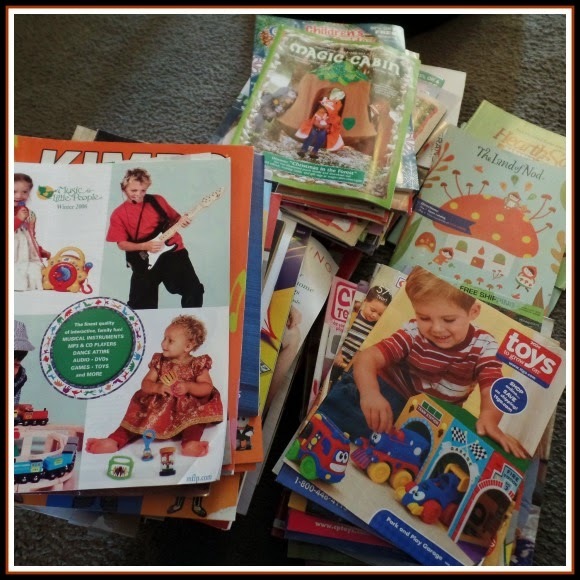 When I talked about my 40 bags in 40 days clutter challenge , I talked about how I was wanting to honor the transition from being a mom of young children to a mom of young adults, so letting go of these catalogs was an important step. I really loved buying Sarah and Joe wonderful toys and books that enhanced their childhood, and these catalogs represented a really fun time in my life. Even though I teach younger children in my Sunday school class still, and look forward to grand kids one day, I decided that I would be more than able of finding great products on the internet, which is mostly what I use anyway, so off these catalogs went to the recycling bin, two whole file boxes full! It seems silly, but it was actually a big step for me, and I'm glad I let these go. :) My tally so far is 17 bags of clutter gone! 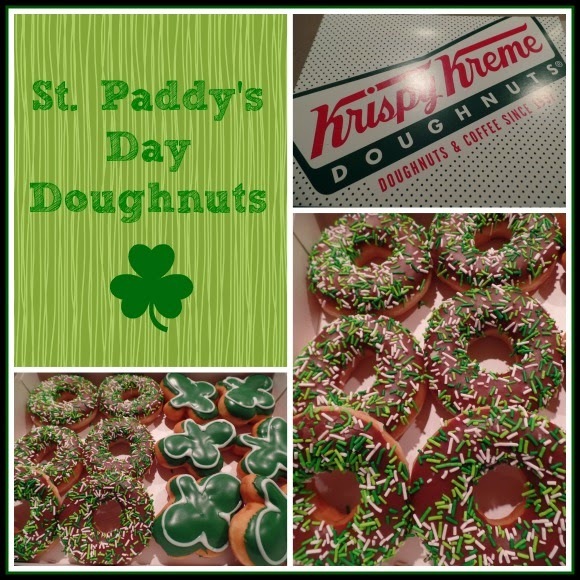 During all of this cleaning I decided a treat was in order, it is no secret that I love doughnuts, and when I saw that Krispy Kreme had St. Patrick's Day doughnuts, I knew we would enjoy some. Look at these fun green doughnuts! Perfect with a cup of coffee for a mid spring cleaning break! 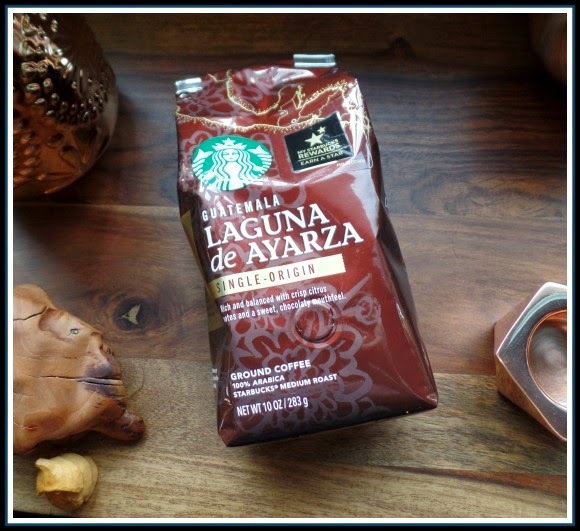 Speaking of coffee, Gary and I decided to try one of Starbucks Single-Origin coffees this week, we went with Laguna de Ayarza from Guatemala. Our everyday coffee is Starbucks blonde roast Veranda blend, which we really enjoy. This new coffee is also delicious, a bit more bold than our normal coffee, but not overwhelming, it is pretty smooth and rich, and I really enjoyed it this morning! So that is what I've been up to this week, I am looking forward to a productive weekend finishing up my office project. Thanks for stopping by! love your dining room. Never been a fan of Krispy Kreme donuts, but the St. Patricks Day ones look like fun. Your library looks wonderful, April! It really looks like a nice serene place to study. The only place we could install our woodstove was in our library, so now it has become a sort of study/sewing/utility room. We collect board games too. Right now our favorite is a card game called Golden Gate. We keep them in an old ship captain's chest. Have a nice weekend and don't work too hard! Sounds like you and I are on the same organizing kick!! Love the look of your dining room. Love the library feel to it!! I had a friend that did something similar and then put a border up around the ceiling that looked like books. It made it look like there were shelves of books all the way around the ceiling of the room!! I love your library dining room together! Thanks for joining Home Sweet Home!